Fruit enzymes (citrus peel bio enzymes) also called garbage enzymes are produced from fruits peels or waste. It is a natural multi purpose, chemical free, eco friendly cleaner. It is biodegradable and eco-friendly alternative to harsh chemicals. Many products that we use in our everyday life like drain cleaners, floor cleaners, dish washing detergents, phenyl, bleach etc contains toxic chemicals which are hazardous to our health and to the environment. It exposes us to many harmful chemicals that have been linked to various health problems and allergies. It is not possible to keep chemicals totally out of our house but we can to some extent, if we take some efforts. I love living close to nature as much as possible and always try to use natural products as much as I can in my daily life. I came to know about this citrus enzyme cleaner through a foreign magazine. I found it appealing and did more research about it and made my own non toxic fruit enzyme cleaner. It is not only easy to make but all the ingredients are easily available in our kitchen and it costs absolutely nothing. These enzyme cleaners are natural, toxic free, chemical free, hence very gentle on the hands. Today let us learn how to make this wonderful, non toxic, eco-friendly, homemade Natural Cleaner/Citrus cleanser. Cut lemon or orange peels (you can use pineapple peels also) into medium sized pieces. Grate jaggery or you can use powdered jaggery or brown sugar. (do not use white sugar). Take a plastic bottle with a tight lid. 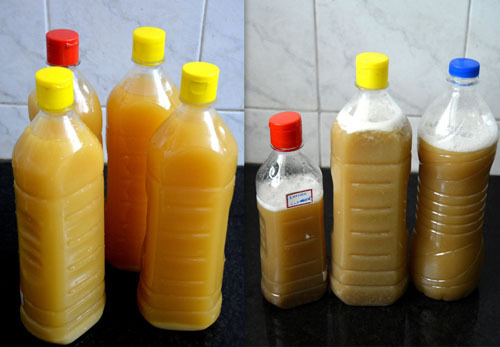 (do not use glass bottles as gas build-up from the fermentation process might cause explosion). Add jaggery and 1 liter of water. Add the citrus peels and yeast. Make sure there is a little space on the top. Fill the container only up to 80%. Close it tightly and shake it well. Label the container indicating the date on which it was kept for fermenting. Leave it to ferment for 3 months. 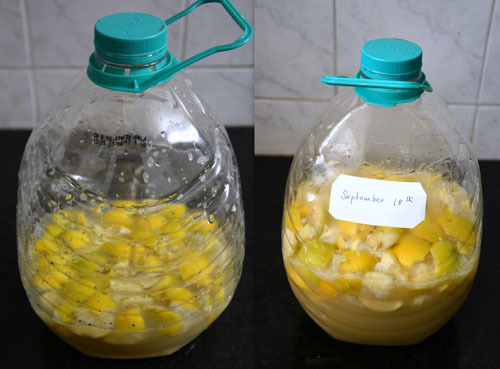 If you add yeast, it will take only 2 months for the fruit enzymes to be ready. You have to open the lid everyday for the first week to prevent gas build up and close it again, otherwise the gas will build up to explode in the container. From the 2nd week, you can open it on alternate days and close it back tightly. After second week, open the lid once in a week to let the gas out. Store it away from sunlight in a warm dry place. It will take 2 months (if yeast is added) or 3 month (if yeast is not added) for the citrus enzyme cleaner to be ready for use. After 3 months, strain it using a cloth or a sieve. The liquid collected is the fruit enzyme and can be used as a non toxic multipurpose cleaner. To make bio enzymes quicker, you can add a tsp of yeast. In that case the enzymes will be ready within two months time. (I have added yeast, so mine was ready in 2 months time). The measure is 1 part Jaggery/brown sugar + 3 parts fruit peels + 10 parts water. Even when making a large batch, maintain the same ratio. Though you can use any fruit peels, I personally prefer to use only orange, lemons and pineapple peels/waste. You can either use them together or separately. 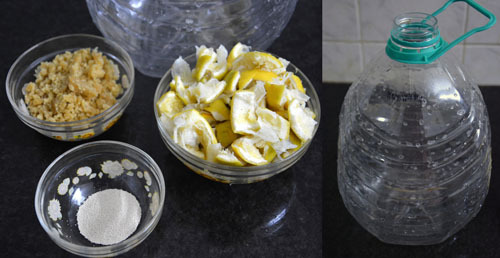 Using citrus fruit peels alone gives a nice citrus smell to the enzyme cleanser. Do not use glass bottles. Avoid adding rotten fruits or dried peels. Use fresh peels for making fruit enzymes. (You can collect and store the peels in the refrigerator, till you get the required quantity. Bring it to room temperature before adding). Fruit Enzyme/Citrus enzymes has no expiry date. You can use it lifelong. Multipurpose Cleaner - You can use the fruits enzymes as a multipurpose cleaner. Dilute it in the ratio 1 : 10 (one part citrus enzyme cleaner with 10 parts water) and use it to clean anything like tiles, bathroom, gas stoves, toilets, kitchen sink, mirrors etc. Use it undiluted for stubborn strains, grease etc. Washing vegetables and fruits - You can dilute it in the ratio 1:20 and use it to wash fruits and vegetables. For mopping floor - I use 1/4 cup of fruit enzyme for a bucket of water and use it for mopping floors. When used regularly it helps to keep ants at bay as the cleaners are natural insect repellents. 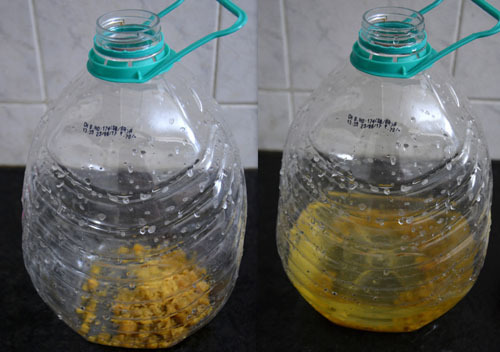 I stopped buying phenol and other floor cleaners, after I started making this fruit enzyme. Car wash -You can dilute it in the ratio 1:20 and use it to wash cars. For cleaning vessels - I mix citrus enzyme cleaner with with soap nut (reetha in Hindi or boondikottai in Tamil) water and use it to clean vessels. The residue can be used as a fertilizer. Dry it well and mix it with soil. You can put it in your composting bin or you can use a little of it as an accelerator for making the next batch or you can grind it with a little baking soda and use it to clean kitchen sink or discard it. Left - Fruit Enzymes ready for use. Right - Fruit enzymes mixed with soapnut water . This is yet another simple step to reduce the use of toxic chemicals in our homes which is not only good for us but also for the environment. This is super duper awesome. Very interesting. If used as a dish wash liquid,how many days a bottle lasts? Very useful information.Thank you. I am searching for this chemical free cleanser for a long time.Maam can we use whole fresh fruits instead of peels. Because merely getting peels will take a long time. Why you want to wast fruits. If you drink orange juice for 3 days, you will get the required quantity. (just 300 grams). Hi I have never seen anything like this. Really good idea. Saves our planet. Should be shared alot. How to make dish cleaning soap using reetha? Will soon share how to make it. Shall we use this as washing liquid for clothes? Yes, you can. I mix it with little soapnut water. No, it will not get spoiled, if we mix it with enzymes. Mix only what is needed for a week. I am doing a detailed post on it. Will soon publish it. 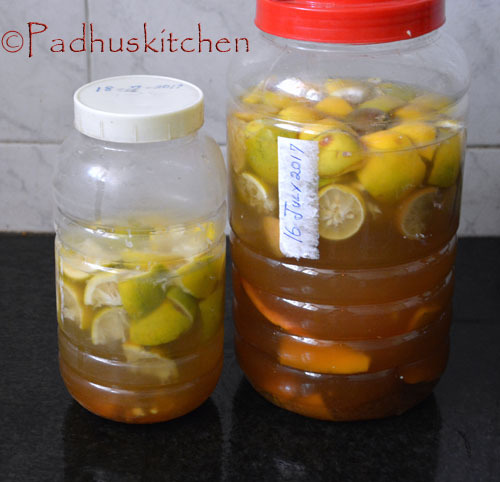 Thanks Padhu.. amazing recipe.. but can we make this in a plastic bucket with loose lid? What yeast should we use? Dry yeast? Yes, you can use dry yeast. Why are we using jaggery powder. Will ot attracts ants if we use it for mopping floors. The jaggery is the food for the microbes. 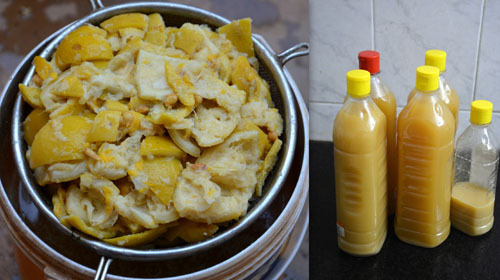 Once it is fermented, it will not be sticky nor will attract ants. I am using it regularly with a little soap nut liquid. In fact it also has insect repellent properties. Hi, can we use few drops of this liquid to mix it in kids bathing water.. Instead of soap..
You can use soap nut liquid for bathing kids instead of soap. Check my post on how to use soapnuts in the "useful tips" page. Follow the recipe as it is. I am doing it for nearly 2 years and do not have any such problems. Do not add amla. Hi. Will ants be attrached if we add jaggery? Can we use the enzyme cleaner on wood also?? why dont we use plastic free bottles for containers,also? The air build up due to fermentation might explode the bottle, so we use plastic containers. I mix it for a week not more than that. Soapnut liquid has to be refrigerated. Bio enzymes stays good at room temperature. Mix soapnut liquid as and when required with bio enzymes.